Back in April I showed a multibeam bathymetric (sea floor topography) map from offshore Half Moon Bay not too far down the coast from San Francisco. 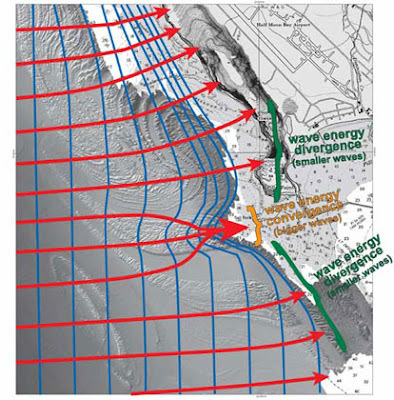 PopSci has a nice little article talking more about how the underlying structure that produces the sea-floor topography as well as the coastal promontory focus the wave energy toward a point called Mavericks. This has some of the biggest waves on the west coast of North America and hosts an annual surfing competition. Check out this virtual fly-over animation as well.